Options: 1 oz. 16 oz. A single biologically active isomer which allows for the same strength at half the use rate of Lambda-Cyhalothrins. 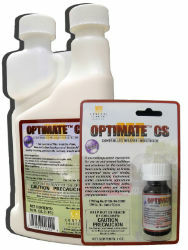 Plus, OPTIMATE™CS is microencapsulated to ensure slow-release and longer residual of the active ingredient. Features CapVantage Technology. For control of litter beetles, fleas, flies and other listed pests of livestock/poultry housing, pet kennels, railcars, trucks and trailers. One pint treats up to 24,000 sq. ft. when treating for litter beetles. Highly concentrated which can be reapplied at 21-day intervals.